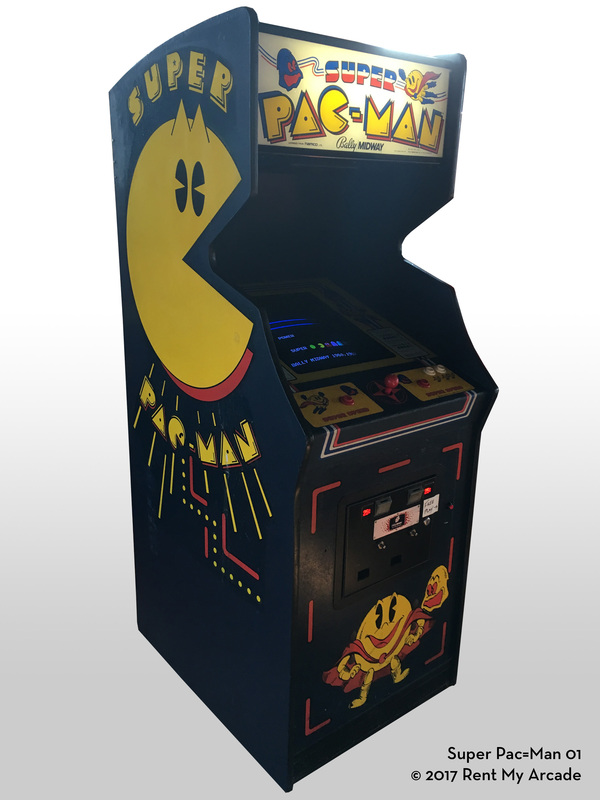 Disguised as your mild-mannered Pac-Man, Super Pac-Man fights a never-ending battle to eat rows of fruit and objects, destroy enemy monsters and rack up scores that are out of this world. Play Super Pac-Man and find a super new Pac-Man challenge. Super Pac-Man mazes are made up of delectable fruits and goodies rather than white dots, and also contain four energy dots, giving Pac-Man the power to chomp down pursuing monsters, and two "Super" dots. When Pac-Man eats a "Super Dot" he becomes... Super Pac-Man! Now 10 times his normal size, Super Pac-Man is totally invincible to monsters and can crash through locked gates as he chomps down rows of fruits! Munch the Keys to Locked Gates! Each maze contains several locked gates that must be opened before Pac-Man, in regular Pac-form, can pass through. By eating the corresponding keys our hero is free to pass through the gates and devour the fruits or objects inside. Rack Up Big Bonus Points! Every third Super Pac-Man maze is a bonus rack. Pac-Man is in "Super" form throughout, racing the clock for Super Pac-Man scores! At random intervals, a star will flash. When Pac-Man eats the flashing star, he scores combinations and matches! Press Super Pac-Man's super speed button on each side of the joystick and away he goes with an extra burst of speed. Once you push the Super Button you'll be a Super Pac-Man lover forever! H: 73", W: 26.5", D: 34"